We are planning a short family vacation at Lake Hope State Park, which is only about 45 minutes away from Marsh Hollow. Dave and I decided we wanted to visit first, to make sure we thought it would suit ages 3 to 78. Yes it will! Anyway, the park has lots to offer, from cabins to camping, to a small beach, marina, hiking trails, archery range, truly tasty dining at the lodge, mountain biking trails (I think it might be the no. one place for this in Ohio), a nature center….and lots of chill time. This would also make a nice day trip from Marsh Hollow….so stay here and go there. 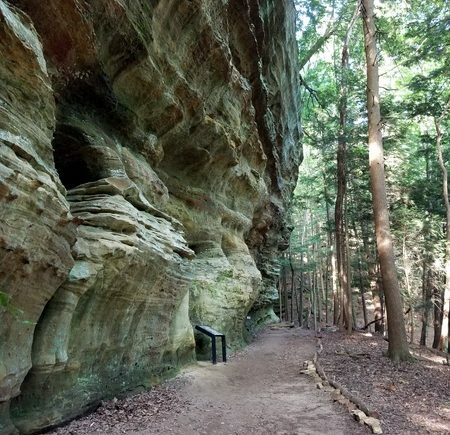 The next stop on our drive was the new Hemlock Bridge Trail at the Hocking Hills State Park. If you follow our Facebook page, you might know that I went to the dedication and vowed to hike this trail soon. So here it is mid-June, and I have not. We are planning a creek bridge replacement at Marsh Hollow and wanted to get some ideas from the swinging bridge construction.We hiked part of it, but the park is not wrong to rate this as moderate to difficult. It is not appropriate for small children. We were not prepared so turned back. Wear your hiking boots and bring your walking stick. Even though we only got to the turnoff to Whispering Cave then turned back, this hike is gorgeous. Our final stop was at Jimbo’s Burgers & Beer, on State Route 56 in South Bloomingville. It is under new management and has been completely remodeled. We sat outside, as it was a beautiful June evening. The outdoor sound system was very nice. They are open Thursdays through Sundays so very much geared to the tourist trade. The mushroom-swiss burger was very tasty and large. You can have it on a pretzel bun or gourmet bun. Fries were also very, very good. The coleslaw was delicious but I generally prefer more cabbage and less dressing on mine. Although we didn’t spend any time inside (except restrooms which are new and spotless), we could see that it was very nice, a mix of tables and booths and multiple big screen TVs. There is also a jukebox, which hopefully offers up more than boomer music. It is also family friendly so yes, bring the kids. The menu includes more than burgers and the beer list is good. Hey, they offer Corona and Blue Moon, and all the traditional Bud and Miller stuff plus 1 IPA. We will go back for sure.